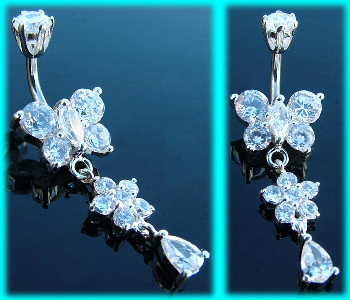 This is a surgical steel navel bar with a sterling silver butterfly and flower design which is set with clear jewels and has a sterling silver, clear jewelled top ball. These navel bars are available in a 6mm, 8mm, 10mm or 12mm size. The 925 silver dangly design features a pretty butterfly, small flower and tiny teardrop dangle, all set with clear crystals, and measures 30mm x 14mm. The piece is finished off with a claw set, sterling silver, clear jewelled top ball. From our designer belly bars collection, this navel bar is also available with light pink, light blue, sapphire blue and black gems, and is only suitable for use in healed piercings. Powered by ShopFactory to sell P8790 online. All-in one eCommerce and online shopping cart software.